We Build It – Sit back and watch as our skilled craftsmen build your garage at a very affordable price. All you have to do is put your car in. You Build It – Take advantage of our mill-direct buying power to get the best quality materials at the best possible prices. The pre-panelized sections and our construction manual save you time and money. Stain for that Up-North look or paint to match. Durable yellow pine and a price that will make you smile. Makes T-111 a great choice for your next garage. “Maintenance-Free”. It just sounds good. With the Georgia Pacific brand you know your getting quality without the hassle. The Vinyl Siding option comes standard with aluminum fascia & soffit, for years of maintenance free use! What a way to finish off that new garage! 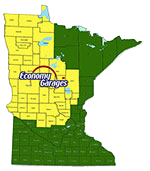 Economy Garages uses only select cedar sidings for that great up-north look with quality to match. A great option that adds to any landscape. Fast becoming a favorite. 2×8 White Pine log siding can change the look of any landscape. A perfect choice for your next garage. Ask your Salesmen about this great look! We do it all Design, Permits, Site Preparation, Concrete and Construction. Our volume and expertise saves you money, while giving you a quality garage.